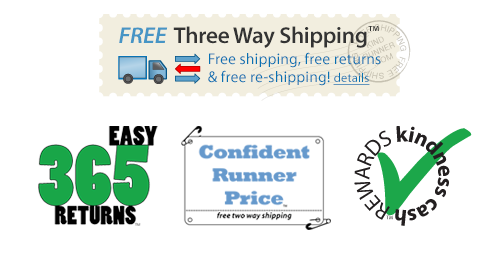 The moment has come - Kindrunner, the one-of-a-kind, online running specialty store is now up and running. I've got to say, I am quite excited for this launch. 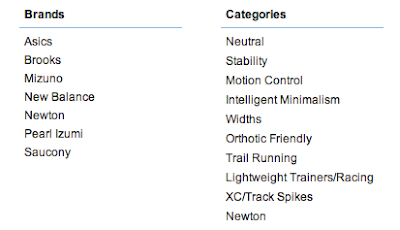 Kindrunner also adds a little extra touch - they have organized their shoes by brand and by categories so you can search for your shoes based on shoe type. I really like being able to search for shoes by categories - and much easier to compare brands this way. How is Kindrunner unique from all of the other online running stores? Free shipping to you, free return shipping, and free shipping of your old shoes for the Kindness Cash Rewards Program. Which is just about the same, except you are waiving your free return shipping for a lower shoe price. You can still return the shoe, but you'll need to pay return shipping. This option would be best if you know exactly what you are looking for. - When you send in your old shoes for credit, Kindrunner donates your shoes to Soles for Souls or The More Foundation Group. - By doing so, you are saving money when buying new shoes AND keeping old shoes out of the garbage, landfills or just filling up your closet. - After you purchase your first pair of shoes, you have the option to place your old shoes into your Kindrunner box and place the pre-paid return label on the box and send them to Kindrunner. When Kindrunner receives your old shoes, your credit will be loaded onto your account for future use. - Each return label (whether is contains 1 pair or 4 pairs of shoes) is worth $10 in KCR per new shoes purchased. If you happen to order 5 pairs of shoes, you can earn up to $50 in KCR. - You can use your KCR on anything Kindrunner sells and your KCR never expires. 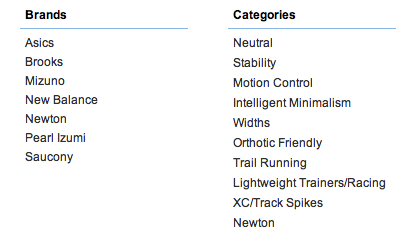 Kindrunner also has expert product reviews. Check out their Meet the Experts page here. Every product Kindrunner carries will have an expert product review video on the same page that product is listed on. The videos are done by individuals who have been working in the shoe industry for a number of years as shoe representatives, store owners, or expert shoe fitters - bringing your the knowledge of your neighborhood specialty running store to the comforts of your own home. - Kindrunner customers have 365 days to return any product, as long at it is in its original packaging and in its original condition. - If you are one of Kindrunner's first 500 customers, you will receive a free pair of socks of their choice from Kindrunner's sock inventory. Disclaimer: I am a Kindrunner Ambassador and will be working with Kindrunner to bring you product reviews. As always all opinions on my blog are 100% my own.